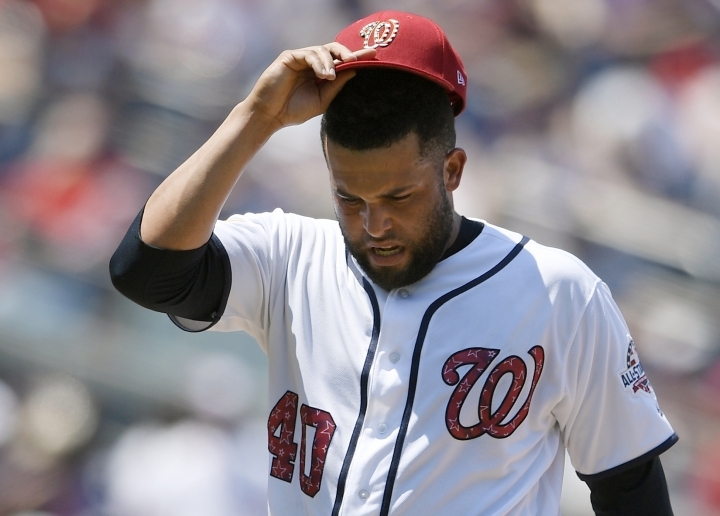 WASHINGTON — Nationals right-hander Kelvin Herrera was placed on the 10-day disabled list Wednesday with a right rotator cuff impingement, a move that further thins the back of Washington's bullpen. The injury occurred Tuesday night in the ninth inning of a 3-1 loss to the Atlanta Braves. After allowing a two-run triple, Herrera was examined by a team trainer and left the game. Nationals manager Dave Martinez said the problem is inflammation, stressing that there is no structural damage. He hopes Herrea can start to throw by the end of next week. Washington already is without closer Sean Doolittle, who's on the DL with a foot injury. Herrera, obtained in a trade with Kansas City in June, was serving as the closer in Doolittle's absence. With Doolittle and Herrera out, the closer becomes right-hander Ryan Madson, who's 2-4 with a 4.32 ERA and has converted four of six save opportunities. "Madson is going to close, and the days he needs off, we'll figure it out," Martinez said. Doolittle took the boot off his left foot Wednesday and threw gingerly. Although the Nationals certainly could use the left-hander, who has 22 saves and a 1.45 ERA, they won't rush him back. "We want to make sure he's healthy and nothing goes backward on him," Martinez said. Washington recalled Koda Glover from Triple-A Syracuse. As a rookie last season, Glover notched eight saves in 23 games before rotator cuff tendinitis ended his season in June. He developed a shoulder issue at spring training this year and pitched in eight games with Syracuse before the Nationals summoned him on Wednesday. "He's here to pitch," Martinez said. "He's ready to go. I'm excited that he's here."